Dr. Abdul Mamoojee speaking about Roman Coins and how they were used for propaganda. 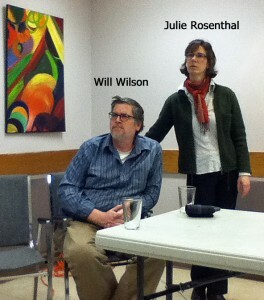 Bev and Matt are moving to Midland, ON. 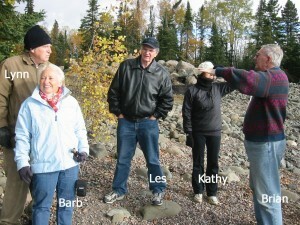 A surprise party was held in their honour at Bonny Wigmore's lakeshore cottage. RALU wishes them all the best in their new home. Bev will remain active on the RALU Executive, for which we are very pleased. 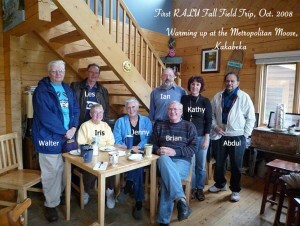 Photos of RALU members, most taken at various events but also some submitted. 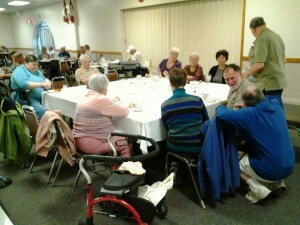 Every month, RALU members in Thunder Bay get together for lunch at a selected location. A stop at the Mt Josephine Lookout, Cook Co., MN. Landforms and archaeological features down the Minnesota shore. Warming up at the Metropolitan Moose, Kakabeka.